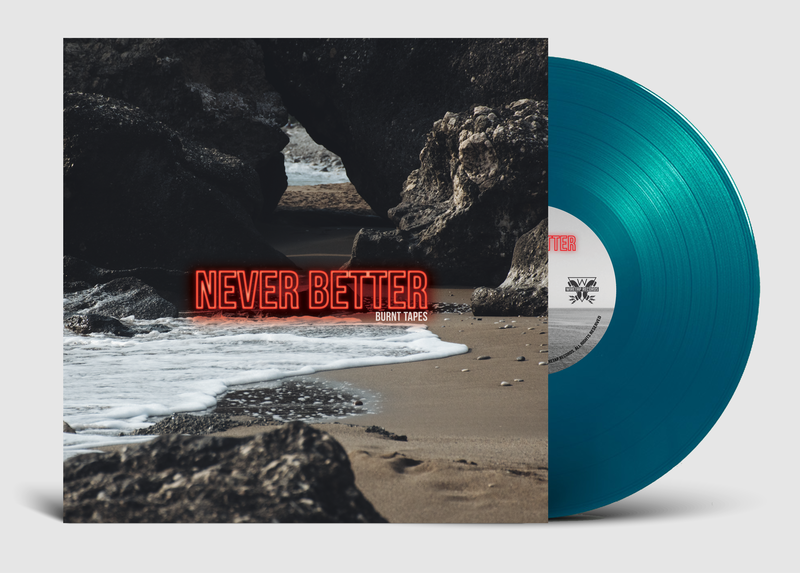 Burnt Tapes - "Never Better" LP on Aqua Blue vinyl. London indie-punks Burnt Tapes are due to release their debut album ‘Never Better’ via Wiretap Records (US) and Lockjaw Records (UK/EU) on February 22nd 2019. Burnt Tapes are known for creating their own unique brand of melodic punk-rock: ‘regret punk’. Inspired by emotive heavy-hitters like Iron Chic, Hot Water Music and The Lawrence Arms, Burnt Tapes create stories through gruff vocals, layered melodies and tattoo-worthy lyrical twists. Debut album ‘Never Better’ features 10 tracks of gripping melodic punk, loaded with hooks. The album showcases Burnt Tapes signature gruff dual vocals; exploring the themes of loss, love and self-doubt that Burnt Tapes have made their core. The album is loaded with memorable one-liners, evocative metaphors and lyrical nods to their previous releases. Never Better’ was recorded with Daly George at The Ranch Studios(Creeper, Milk Teeth, Boston Manor). It follows the success of their critically acclaimed EP ‘Alterations’ (2017), plus two earlier self-recorded releases: ‘Elsewhere’ (2016) and ‘Delete History’ (2014). You can hear the bands’ growth with each release; none more so than on this, their finely crafted debut full-length.